This morning Netflix decided that no one needed to do any work today as they unexpectedly dropped an epic Stranger Things 3 trailer. It’s safe to say that we ARE NOT OKAY. The trailer brings everyone back together on our screens for a summer that will change everything and it’s a glorious site to see. It’s full of nostalgia, brilliant ’80s style, new characters and Steve in a sailor costume – need we say more? Of course, nothing is ever chill in Hawkins, Indiana, so things quickly take a dark turn, but after three years we’ve come to expect it. Check it out below. Seeing that fans were expecting the trailer to drop on World Rat Day in April, no one was really prepared to be heading into the fields of a teenage wasteland so soon and Twitter naturally was popping off. 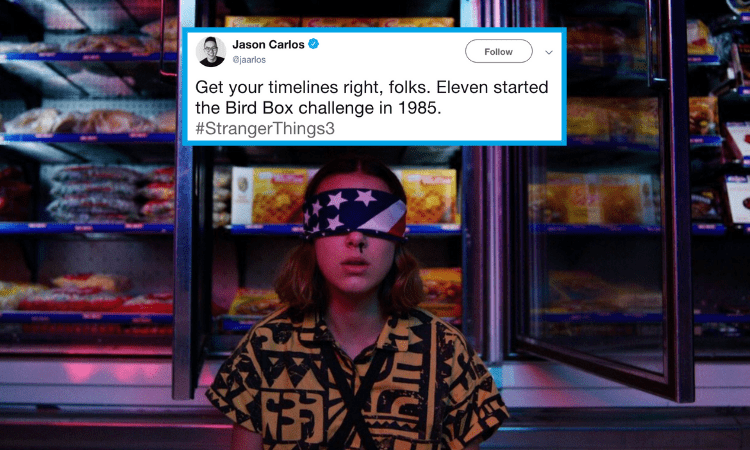 Here are some of our favorite instant reactions to the Stranger Things 3 trailer! Stranger Things 3 will drop on Netflix on July 4, 2019!